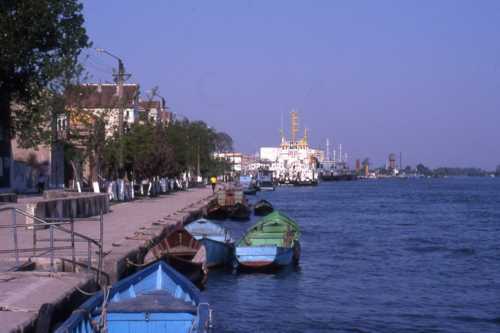 Sulina, the second town of the Delta after Tulcea, is an important river- and seeharbour, situated on the place where the branche of the Donau with the same name flows into the see. The town has a shipyard, lamp factory and food industry. Around 950 it was a Byzantijn harbor named Sellina, a Genoaesen harbour in 1318, and later a navy base for the Ottomans. Early 20th century it became a free port, Porto Franco, described in the novel Europolis of the Romanian author Jean Bart (Eugeniu Botez). In 1802, housed the European Committee for sthe Danuba, which building still exists. An old lighthouse with typical delta architecture (built in the 19th century) stands in the middle of the town. The town has a hotel and a large beach.